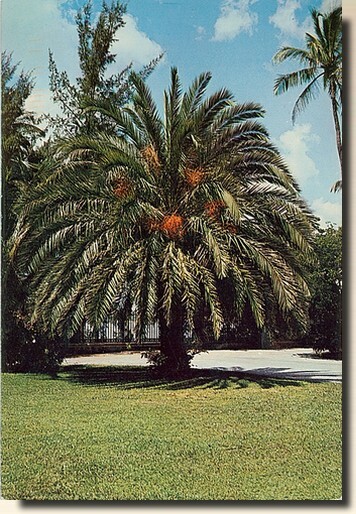 The date palm (Phoenix dactylifera) is a palm in the genus Phoenix, cultivated for its edible sweet fruit. Although its place of origin is unknown because of long cultivation, it probably originated from lands around the Persian Gulf. It is a medium-sized plant, 15 - 25 m tall, growing singly or forming a clump with several stems from a single root system. The leaves are 3 - 5 m long, with spines on the petiole, and pinnate, with about 150 leaflets; the leaflets are 30 cm long and 2 cm wide. The full span of the crown ranges from 6 to 10 m.